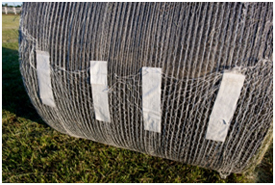 B-Wrap is applied onto bales just like net wrap, but it protects hay much better than net. 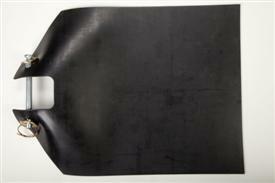 B-Wrap includes a special patented material with Tama SCM™ technology. It sheds rain and snow while protecting the bale from ground moisture. Plus this material has microscopic pores that let water vapor inside the bale escape. B-Wrap is the alternative to indoor storage, delivering barn-quality hay without the barn. 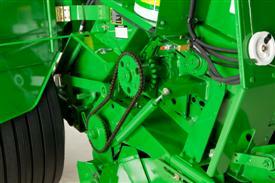 B-Wrap protects bale quality in all types of crops. 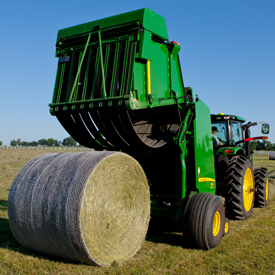 Use B-Wrap on top-quality hay, as well as straw, peanut hay, and corn stalks. The B-Wrap kit is easy to install. 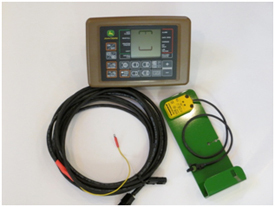 The kit includes wiring that connects a sensor to the bale monitor and an EPOM chip is also added to the bale monitor. The B-Wrap kit is available for all 9 Series Round Balers and comes as standard equipment on the 469 Premium and 569 Premium. 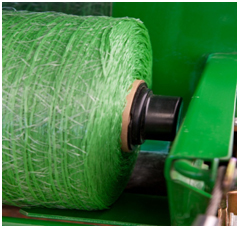 A roll of B-Wrap looks and weighs similar to a roll of net, and B-Wrap loads into John Deere round balers exactly like net. 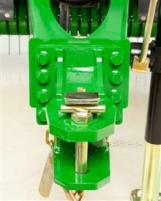 B-Wrap is designed for bales 152.4-cm to 172.7-cm (60- to 68-in.) in diameter. A roll of B-Wrap for 1.5-m (5-ft) balers has 35 premeasured portions, enough to wrap exactly 35 bales. 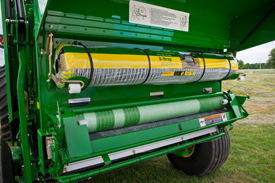 A roll of B-Wrap for 1.2-m (4-ft) balers will wrap exactly 45 bales. 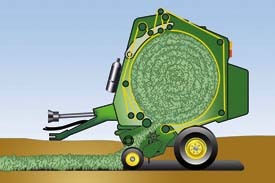 B-Wrap works in round balers much like netwrap. 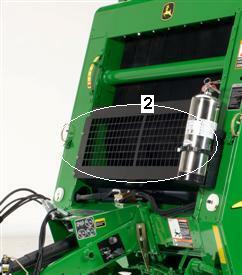 The B-Wrap kit allows a baler to use either B-Wrap or net. Switching between net and B-Wrap will take less than 5 minutes. 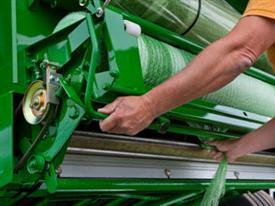 Simply switch rolls, properly thread the new wrap into the baler, and then change bale monitor settings. 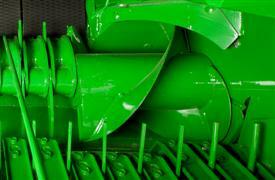 Here is how B-Wrap works in the baler. 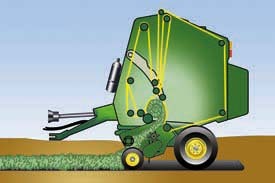 When a bale reaches the maximum size programmed into the monitor, the operator stops forward travel and wrapping begins. 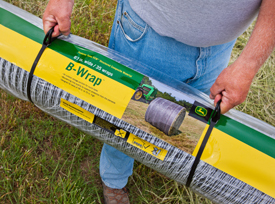 The first length of B-Wrap is John Deere CoverEdge™ netwrap. 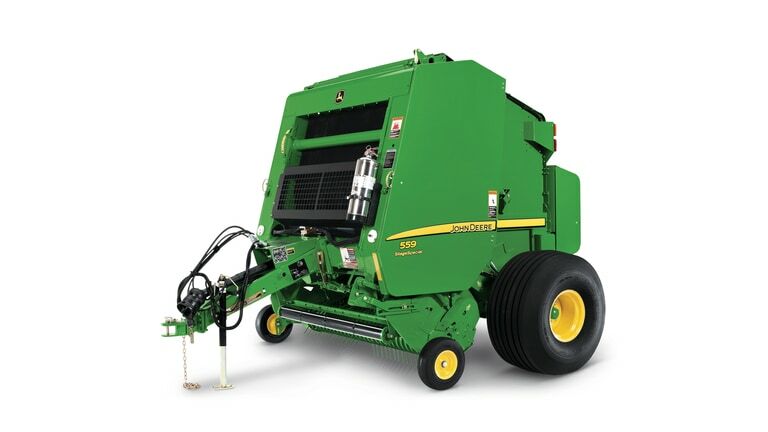 John Deere CoverEdge goes right over the edge or the bale, pulling in loose crop material, giving the bale a solid, weather-resistant shape. 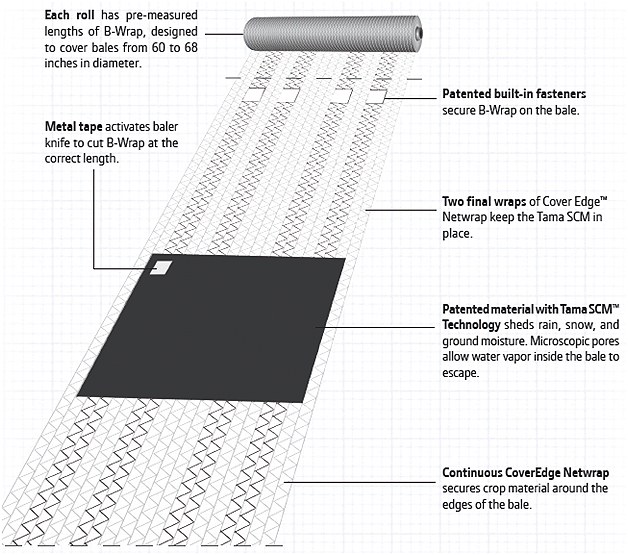 The next length of B-Wrap includes the patented material with Tama SCM technology. It sheds rain and snow, and protects bales from ground moisture. The final length covering a bale is two more wraps of John Deere CoverEdge net. 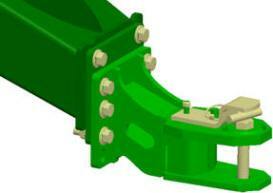 This securely holds the weather-resistant Tama SCM in place. Metal tape on the SCM activates the knife, cutting the B-Wrap at exactly the predetermined length. The operator then backs the baler up about 3 m (10 ft) and ejects the bale. 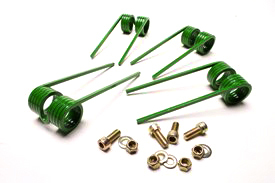 Built-in fasteners keep B-Wrap in place during storage. 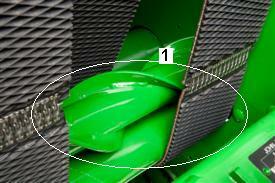 While B-Wrap does allow moisture inside the bale to escape, baling hay too wet will cause mold to form. B-Wrap is for dry hay only. 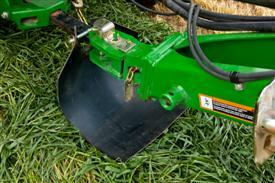 Operators should bale hay at the same moisture level they would when using net. B-Wrap can dramatically reduce bale damage caused by ground moisture, but bales must be stored in a well-drained location. 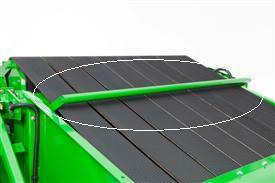 To make sure the seam of the Tama SCM is in the proper location, bale kickers and bale ramps must be deactivated. 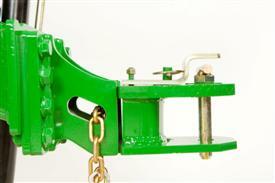 The bale operator must back up about 10 ft before ejecting a B-Wrap bale. B-Wrap does cost more per bale than net wrap, but it protects feed value much better. Users report that hay and straw looked and smelled like the day it was baled, even after a winter stored outside. 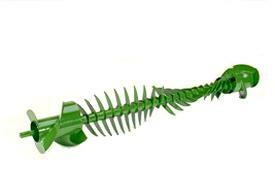 B-Wrap is only available initially with a standard kit. 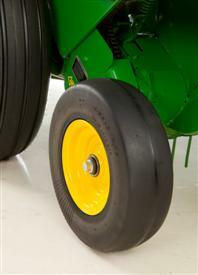 The standard kit (BE32467) requires the operator to shut off the PTO with each bale. Full production available in US and Canada for 2014. 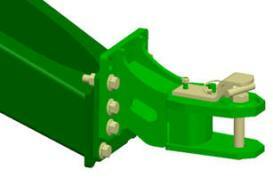 The CoverEdge surface wrap attachment is available on 459, 459 Silage Special, 559, 559 Silage Special, 469, 469 Silage Special, 469 Premium, 569, 569 Silage Special, and 569 Premium Round Balers. 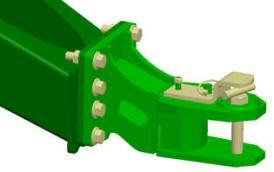 This attachment is an exclusive feature of 7 Series, 8 Series, and 9 Series Round Balers. 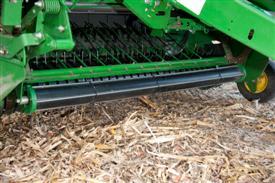 The CoverEdge surface wrap stretches over the edges of the bale to cover 15 percent more surface area on the bale. This added feature allows better weatherability by shedding water off the ends of the bale and increases marketability, due to less crop spoilage and a better-looking bale. Net material clings to itself and holds the bale. Twine is not required when using net wrap. On 459, 459 Silage Special, 559, 559 Silage Special, 469, 469 Silage Special, 569, and 569 Silage Special Round Balers, the BaleTrak™ Pro monitor-controller can automatically adjust twine or surface-wrap application to compensate for a revised bale-diameter setting or a smaller size when finishing up a field. The operator just presses the wrap symbol on the BaleTrak™ Pro monitor-controller to initiate this command. If running less than rated power take-off (PTO) speed, the slip-clutch alert/speed compensation option compensates the number of wraps selected for a bale. Without the slip-clutch alert/speed compensation option, the wrapping program is based on the rated PTO speed. 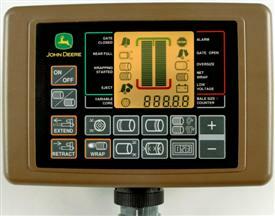 The operator can select twine or surface wrap with the ISOBUS monitor conveniently from the tractor seat. 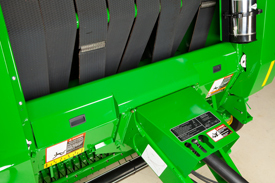 The roll of surface wrap is loaded in the unit at the back of the baler, making it easy to load. 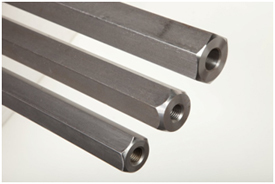 The brake handle can be used to ratchet the rolls which will feed the net wrap in just slightly and pinch it to hold it in place. Ratchet the brake handle four times and lock in place on the fourth time so as to not over feed the net wrap. 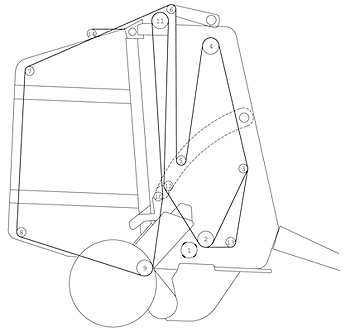 Storage space is provided inside the net-wrap attachment for an extra roll of net wrap. 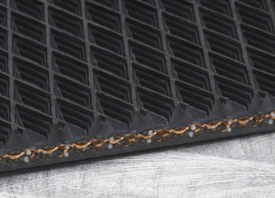 The 459E features an Edge-to-Edge surface wrap option that loads exactly like CoverEdge. 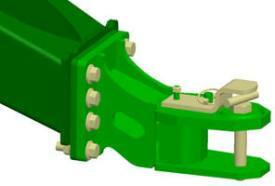 Edge-to-Edge surface wrap material works in the 7 Series, 8 Series, and 9 Series CoverEdge surface wrap attachment. 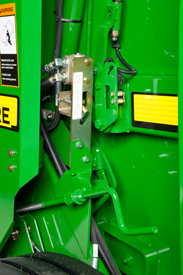 Refer to the round baler operator's manual for proper adjustment. 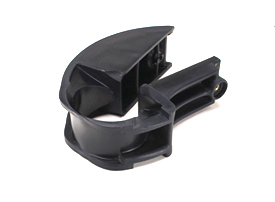 Plugs are available through AMBRACO to center the roll in the attachment.